Every day, Watch This offers staff recommendations inspired by a new movie coming out that week. This week: The Incredible Burt Wonderstone has us thinking about other films about magicians. Over the course of nearly four decades as a team, Penn and Teller have conquered Broadway and Vegas, created a hit TV series and award-winning specials, published bestselling books, and generally eclipsed every other comedy-magician act. Their one attempt to break into movies, however, way back in 1989, was a notorious box-office flop, lasting only a single week in theaters before gathering dust on video-store shelves. 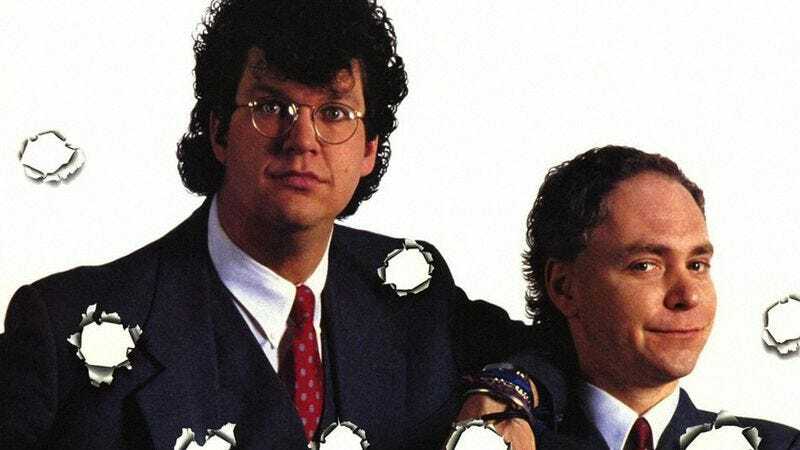 Penn & Teller Get Killed (“What more do you want?” asks the tagline), written by the duo themselves, features an absurdist plot in which Penn tells a talk-show host that he wishes somebody were trying to murder him, triggering a vendetta from a crazed “fan” (David Patrick Kelly) that may or may not be part of the most elaborate practical joke ever conceived. Along the way, there’s plenty of time for Penn’s voluble aggression and Teller’s silent-clown mugging. Availability: Penn & Teller Get Killed is available on DVD from Warner Bros. (though Netflix doesn’t carry it, for some reason) and can be rented or purchased digitally on Amazon and other sites.